AB 51, which recently passed the Senate Transportation Committee 11 to 0, has passed the full Senate, 38 to 0. The full vote happened yesterday, August 1st, 2016. The bill now goes back to the California State Assembly where it originated, for concurrence—meaning that the house of origin must approve changes made to a bill while it was in the second House (from the California Legislature glossary). Remember, AB 51 has been amended since it was introduced last year, but heavy involvement from all involved parties along the way makes it likely that the bill will be approved, and if not, it’s eligible for a two-house conference committee composed of six legislators, three from each house. If required, the committee meets (in public session) to reconcile differences between the Assembly and Senate versions of the bill. We here at LaneSplittingIsLegal.com (and CityBike Magazine) have been strong supporters of AB 51 since last year, and I’d be surprised if AB 51 required a conference committee. So assuming it achieves concurrence, the next step is a signature from the Governor. Stay tuned here or to the LaneSplittingIsLegal Facebook page for updates. Thanks. But your video doesn’t reflect how lane splitting or lane sharing should work. The “be courteous” message is good, but splitting is about using existing, un-utilized space, not asking for additional space, or for people to get out of the way. “nicer” example, the rider is still asking for extra space. Perception that we’re asking for space or “special treatment” as some drivers perceive it actually hurts our position in discussions about splitting. Kevin, it’s less about riders than drivers. There’s a lot of perception of “cutting in line” from drivers, and asking for extra space—even nicely—contributes to that. We *aren’t* asking for more space—we’re like water flowing between rocks. Kevin, Surj has a very good point. I will add that quite a few Riders abuse lane splitting and their actions appear to be that of an ‘Entitlement’ or ‘Special Privileges’ point of view. They are rude and are not riding with their safely – nor with others’ safety – in mind. Lane Splitting should not be about – I am better than you on my smaller sized vehicle – thus I am entitled to slam the Screamers or edge you over. My family consists of multi-decade motorcycle riders from Indians, BMWs, Harleys to Rice burners and beyond. On road and off road. Females and males. However, most of us have common sense. If it is safe and the space is open – AND we are not going the speed of light – then fine. However, we also comprehend the non-bike vehicles are bigger and can be dangerous. We keep that in mind when on the road – at all times. Your approach tends to encourage poor behavior on the part of bikers, it tends to spank non-bike riders and it fosters animosity. Thus your flippant comment to Surj’s well thought out approach indicates you a) do not look at all perspectives b) you do not care about the safety of all concerned c) you are all about ego. I also agree, revving loud pipes and acting foolish is NOT helping us. I put 38k miles on two wheels last year, many between cars, kept my composure and remembered those cagers can end our ability to filter if we abuse it. Don’t be a contributor to cagers taking this away from us. People need to stop posting videos that show us as elitists and people with attitudes that weigh more than the bike. I hate that a law has to exist that gives us the “right” to legally lane split, we need less laws but that’s our country. Glad someone like Surj was involved in helping with the law and I guess I’ll trust he did all he could to prevent to many restrictions that we can now get ticketed for unlike before (just wreck less driving). Man I hate laws. In the state of Georgia it’s illegal to split lanes. In the state of Tennessee it can get you a felony conviction .I can see the benefits of it however. Especially in large cities. I like the guidelines set up. Maybe we should focus on getting dedicated motorcycle lanes on the major highways now. With all the bike traffic during commutes, it seems like they could spare 6-8 inches out of a three-plus lane highway to make a 36″-40″ lane next to the left shoulder. Unfortunately they have narrowed many highway lanes down to the point that larger commercial vehicles and buses barely fit. Taking anymore room could put everyone in danger. I split lanes daily and within the same 1/2 hr time frame for the last 4 years that now the routine drivers that I see know I am willing to wait till it’s safe for all before i pass them specially since we have a lot of center median work going on in my area. It just kills me when I see that azzhat who decides they have to weave in and out of lanes splitting between the 3&4 lane just to end up next to me at the bottom of the offramp. We’ve covered this before, and frankly have to have this conversation far too often. Remember the lane splitting guidelines? Those were good, and the OTS surveys were showing signs that riders were splitting a little slower and driver sentiment towards splitting was improving. The guidelines were shut down by OAL, and we lost that. AB 51 gets us legal splitting with no more restrictions than the none we have now, and allow CHP and other orgs to develop, publish and promote guidelines, meaning that we can educate riders and make them safer splitters. Well, either I didn’t read the CURRENT version of AB 51, or you have some kind of magical legal interpretation powers that I don’t. I’m sure I’ll get flamed in some way for this, but I have been a licensed, practicing lawyer in California for over 20 years and a motorcyclist in California for over 30 years. The PLAIN meaning of the current AB 51 text ONLY *defines* what lanesplitting. It does not contain any language that states that it is legal or granting a right to do it (nor a prohibition against it). Again: what does that do? That the CHP “may” create educational material about it? Well, that is something but hardly anything. It just seems like a pointless exercise unless it clearly states that it is legal/allowable/permissable/may be done (or “shall not” be done). And, even the CHP part is weak because there is NO authorization of funding so the money to pay for such “educational materials”–if any–will have to come out of the CHP’s existing budget. Please explain how that is a benefit (and do not insult me “…frankly have to have this conversation far too often…”) I AM ON THE SIDE OF LEGAL LANESPLITTING. And I have been having this conversation with other riders and non-riders for over 30 years. Nameless Lawyer Guy, that is a good thing for the reasons I already stated. The lane splitting guidelines were good for riders, but were shut down by OAL. This bill gets us legal lane splitting without new restrictions (something most of the MROs and other rider representatives involved wanted almost unanimously) but opens things up for the CHP and other orgs to develop, publish and promote guidelines, meaning that we can educate riders and make them better, safer splitters. If you don’t believe that’s a good thing, I urge you to spend some time on the resources page here. Start with the OTS surveys, and read the Berkeley / SafeTREC research. It’s pretty clear. Note that there is existing funding for motorcycle safety programs. You’ve heard of the CMSP, yes? 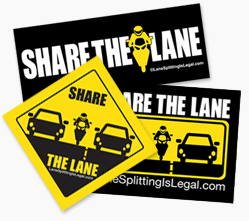 Perhaps you saw or heard some of the lane splitting commercials a couple years back, or saw the lane splitting guidelines pamphlets? We do have this conversation way too much—for example, you and I have had it twice now. Given the wealth of information, it’s disappointing that riders choose to remain ignorant, or cling to misinformation and knee-jerk “no new laws” reactions. We riders are our own worse enemies in many ways, in how we ride, how we don’t unify, how we don’t educate ourselves. HOW does this bill give us LEGAL lane splitting? It is NOT in the language. It neither expressly makes it legal but it does not make it illegal so it seems like it remains the status quo–if it isn’t illegal, then it is legal (again, YOUR words). I did NOT say AB 51 was a bad thing. I said that it was ineffective in really moving the ball forwards other than providing a legal DEFINITION of what lanesplitting is. Now, I don’t know where CMSP funding comes from. It doesn’t matter. The fact is, there is NO current money set aside, especially considering that the state legislature ALREADY passed the 2016-2017 budget! So that means any funding for anything allowed under AB 51 has to come out of existing budgets. Exactly whom is going to cut what in order to fund any of those possible things (especially CHP educational programs about lanesplitting) during 2016-2017? Actually, TPB, I am getting off the hook. I don’t have time for 1:1 lessons given your belligerence and lack of willingness to consider the information I’ve given you. This is my last try. Lane splitting will now be defined in the vehicle code. It will also not be prohibited. That’s legal lane splitting. As I, and many others, have said all along, things that aren’t prohibited / illegal are legal. We get that, and specific allowance for guidelines. As for funding, the CMSP money largely comes from bike registration. It’s earmarked for the CMSP, so you needn’t worry about “whom is going to cut what” to fund safety programs. There’s roughly $10 million sitting there, and while it’s true that we can’t just spend it willy nilly, and we won’t be able to spin it all up in 2017, you need to take a longer view and understand that the money can and will be used to fund educational programs such as the guidelines going forward. Now before I bid you good night, I urge you to ease up, read up on the myriad items you seem to be comfortable speaking authoritatively on in spite of an admitted lack of knowledge, and ride safe. Yeah, that’ll be MUCH easier than having just gotten it done in this legislative session. And “guidelines” aren’t laws. Maybe if you’d gone to law school you’d know the difference. Well, at least you haven’t run CityBike into the ground, so kudos on that. Oops, now delete or edit features. Surj, I apologize for that–that’s the very definition of trolling, right? Sorry. But take a look at what sportrider.com said. Basically, just what I said to you (and, no, I’m not Andrea, the author of the SR article!). So when did lane sharing become illegal? I’ve been riding in California since 1984 and I’ve been lane sharing since that time. I was out of state in 2013 so maybe I missed the vote that stopped lane sharing. Leaving Lax yesterday I witnesses many bikes splitting lanes. Unfortunately for one, he hit a BMW and went down. I have been riding for 59 years and find it insane to run on the freeway splitting lanes. Might be good for some but not for me. So does this mean that micro-cars can lane-split too? I mean, if there’s room and they follow the guidelines? Why not, right? I just moved to CA 2 years ago and it was my understanding that CHP Motorcycle riders had asked for lane splitting long ago to keep from burning up clutches when in heavy traffic. My understanding was it was not explicitly legal but accepted IF going less than 20 MPH. I do lane split only when traffic is basically stopped. My bike is not loud and I’m just creeping along. I’ve found the vast majority of drivers when they see me crawling along DO give extra space. I always thank them if their window is down or nod a thanks. I have found if you explain to folks why I lane share it makes sense to them. It does NOT make sense to me that I or anyone needs to lane split when traffic is moving along and certainly not in excess of 60 MPH. Personally I would never go over 20. It’s just not worth my life. The one thing I haven’t been able to get an answer to is if it is OK to use the shoulder when traffic is basically stopped. Seems to me it’s much safer there than going between cars. Short Answer: Driving on the shoulder in CA is illegal. The only times you can go onto the shoulder is in an emergency (vehicle problem, occupant health problem, or to avoid running into the car ahead of you) OR where it is legal to PARK on the shoulder. ALSO: it is illegal to lanesplit between an HOV lane and the lane next to it (on the right) and illegal to pass cars in the HOV lane when you are in the HOV lane–consider all of those HOV lane lines as if they were an actual physical barrier but be aware that many drivers will illegally enter the HOV lane and/or use it to pass other cars, so keep your eyes open and don’t be complacent when you’re riding in the HOV lane. ALSO: it is illegal to ride between the right lane and parked cars/curb or between the center line and the left/only lane even if traffic is at a standstill or even at a traffic light. Is that okay, Surj? Did I get that right? I acknowledge and wave back when drivers move left to make me pass. I pay back the courtesy. During the month of May, before summer kicks in, the CalTrans jumbo-trons always announces to everyone in the freeway to share the road. I think this is a good way to make cagers be aware of riders. First of all it’s already ALLOWED in California. this law changes nothing. Secondly there are LOTS of reasons “for’ it. Namely that it’s safer. it cuts risk of head injuries dramatically and reduces rear end collisions in HALF. And it creates better traffic flow for ALL traffic for a total cost of Zero dollars. But don’t bother to research facts or let anyone change your mind. I’m sure your dogmatic thinking will win out in the end. Personally I think this whole thing is a waste of time. It was already legal to lane split in CA but now, you’re going to give the LEO’S some more definitive rules on it which simply gives them more ammo to cite you for doing it wrong. It was never prohibited so it was already legal. If it works why fix it? At the end of the day we had legal lane splitting already. All I see this doing is adding restrictions to it by giving it definitions which in turn makes it easier for LEO’S to sell you a ticket to the policeman’s ball. I hope it dies and doesn’t pass. And from a rider who lives in Connecticut and travels to California on business frequently, I think the entire idea is nuts. Its not legal in most states. Therefore visitors are unaccustomed to a bike passing on the center line. Having visited California hundreds of times over the years, I should be acclimated to this practice and yet I’m still frequently caught off guard when someone on a bike passes between lanes. I’m simply saying, I would never do it knowing that there are lots of folks just like me on your roads every day. And I’m one of the good ones in that I ride myself and I’m aware of the law. Safety first and foremost. Thanks for posting your perspective, Jeff. If safety is truly first and foremost, though, there are safety benefits to splitting—give the Berkeley / SafeTREC studies on our lane splitting resources page a read. “Safety first and foremost.” Exactly–while lanesplitting is legal, the rider is still responsible for obeying all of the other rules of the road. And the rider, as always, has to exercise all due discretion in lanesplitting safely: Is there enough room to lanesplit? If a car suddenly moves over without first signaling, am I at a speed where I can still slow down or stop without colliding with that car? My own personal guidelines are almost the same as the original language that’s has been removed from AB 51 (and I endorse that missing language), but personally, once traffic is moving 30 mph or above, I feel like I’m making reasonable progress to wherever I’m going and just assume a position in the lane. And lanesplitting is legal throughout much of the world (maybe all of it? probably not North Korea–because who has a motorized vehicle there? ), so are all of those countries wrong like CA? Don’t they all have the same issue of people from other places not understanding that lanesplitting is illegal (not to mention all of their other traffic laws)? Different states even have laws about whether or not it is legal to turn right on a red light and many other variances that people from other states may not be aware of but you know how that goes, too: Ignorance of the law is no excuse. Lane splitting is pretty easy, once you follow some common sense rules. I have thousands of miles of lane splitting behind me. I live in Socal, can’t help but lane split. The legislature can’t make it legal without repealing or amending these statutes. I am going to assume that those are the correct CVC sections and yes, that is true, and I truly wish that law enforcement had the resources to enforce that (and that people would simply learn it in the first place in driving school). But lanesplitting is not the same as lane changing. Yes, while lanesplitting, the rider will move from the edge of one lane across the center line to the other lane many times over a long distance (not exactly like a slalom skier), really within a 2′ range from left to right, in order to stay within a safe gap between vehicles (since they simply refuse to stay in a nice, straight line like synchronized swimmers or The Rockettes). It is not actually possible from both safety and practicality standpoints to hold position laterally on one side of the lane line but neither is lanesplitting moving from the center of one lane to the center of the other–the rider is not even moving over in front of the cars they are passing–so signaling would NEVER have any safety notification effect to the cars that one is lanesplitting past. Those code sections were not intended to apply to lanesplitting (and if you can show me that was in fact part of the the original legislative intent in passing those sections into law, I will gladly admit my error). Signaling before changing lanes is to inform the driver you have passed that you want to move over to their lane in front of them, not to inform them that you are simply going past them. A rider veering from one lane to another, whether signalling or not, is not lanesplitting. To say you truly wish that law enforcement would enforce those two statutes is to say that you truly wish lane-splitters would be cited for the countless VC violations they commit. Your attempt to distinguish motorcyclists’ violations of these statutes from passenger vehicles’ belies an ignorance of the law. I have had MANY clients whose encounters with law enforcement began with being pulled over for unsignalled lane changes. For now, no single member of law enforcement will ever publicly state that motorcyclists don’t need to signal lane changes but all other motorists do. That is because unsignalled lane changes are violations of the Vehicle Code. There is no dispute about this. That is why the pending legislation is misguided: it is inconsistent with existing law and does not purport to reconcile the inconsistency. Just make a contradictory law and see what happens . . .